India turns itself into a Bollywood potboiler pre-Lok Sabha polls and there is precious something for everyone to enjoy from the safe distance of a TV or laptop. Scandals, political stunts, mudslinging, witty wordplay and of course, propaganda art and graphics- this year Lok Sabha elections brought back to our memory the grandeur of world’s 7th largest democracy. The latest from vote campaigning trail this year emerges the celluloid fiasco that involves two mammoth political parties in India- BJP and TMCP (ruling party in West Bengal). The ban on PM Narendra Modi and deliverance of political satire Bhobishyoter Bhoot to public theatres sent a scathing response to both the parties wriggling to maintain power in their respective territories. The honored practice of parties using modern media like TV, silver screen, and cell phones as a means of vote bank politics was met with a jolt. Besides giving us a reality check of propaganda and bureaucracy, 2019 has been a harsh reminder to many who still prefer to bathe in the yesteryear romanticism of politics. We seem to have come across a long way since election campaigns- humble efforts of meeting people at their doorsteps and delivering speeches through the public address system. 2019 has shown us the discrepancy between totalitarianism and democracy, a lesson in history itself. 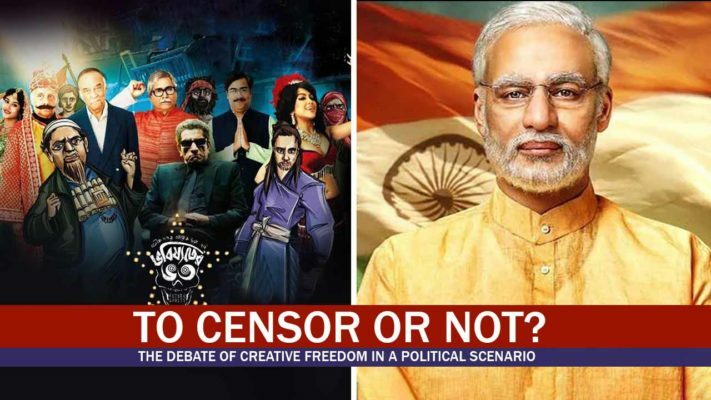 With Bhobishyoter Bhoot and PM Narendra Modi, both the parties have lost a lot of ground, ensuring fresh rounds of debates regarding artistic freedom in India. While in one instance, Mamata Banerjee government has been slapped a fine of 20 lakh, BJP has been forced to distance itself as much as possible for the party’s puny political reputation. EC’s verdict to pull stall Modi biopic verging on a hagiography till the end of elections is at par with Twitter, Fb and even Whatsapp taking down “posts” violating the MCC (Model Code of Conduct). It comes at a juncture when two major Bolly films have already been released and applauded at, churning heroism out of bloodshed, glorifying a certain political party in its wake. Uri: The Surgical Strike, and Thackeray both argued to have distorted historical truths of political gains, especially the later one. These films have already built the solid groundwork to pump the entire action of “party campaign”. Modi biopic dramatizes various historical events, portraying our Prime Minister at one point of time almost in a deific figure, contradicting openly held opinions regarding sensitive issues like Gujarat riots, 2009. While many critics including names like Naseeruddin Shah have opined that hagiographic content promoting the ruling party is on the rise, we have a web series looming on the horizon. Therefore, it is just not a matter of one single biopic hitting the theatres at an impressionable time. It is also about a general increase in patriotic cinema disproportionately sensationalizing historical episodes. It would be appropriate to quote Abbas Kiarostami here, “ I would say that no film is apolitical”. If you are tired of all the loopholes in election protocols, and subsequent airing of political content, wait till you deal with NaMo TV, flouting the MCC! To many, Modi biopic seems like an extended and hackneyed advertising campaign, cliched enough to make the opposition parties feel left out. According to EC, the film’s content is certainly against MCC that clearly prohibits the ruling party from influencing common people through mass media. Most of the programs that the ruling party has managed to air are either by straight forward disobedience to law or a twisted way of doing so. Now, whether the casting and crew had any bearing with the unnatural coincidence of the biopic’s release could only be argued about! Political Satire In Full Swing With Bhobishyoter Bhoot! To most of the film critics, Anik Dutta’s Bhobishyoter Bhoot is a lengthy narrative using literary devices like satire, rampant puns thrown at political institutions, crass humor and some serious political squabbles. Of course, many would fail to vouch for this statement. Why? The film was unceremoniously pulled out of theatres without any prior explanation to director Dutta or producer Kalyanmoy B. Chatterjee. According to Dutta, West Bengal’s ruling party had a say in the entire conundrum leaving Chatterjee financially bleeding. It started a fresh wave of heated protests in the entire film fraternity and accolades. On 11th April, SC passed the order that the film should be reinstated in theatres and multiplexes, causing the political spectacle shift to West Bengal. Bhobishyoter Bhoot is rumored to be a daring venture that criticizes bitterly political ideologies, from left to right, perhaps first in a long time. To a majority, it might have done “public sentiments” some good to put the film away especially when polls are in full sway! The SC verdict shows pre-poll India firmly rooted in its democratic convictions asking TMCP to compensate for the producer’s loss. To Wallow In Election Entertainment! “manipulate, influence and impress viewers and voters”- an excerpt from the plea to ban screening of Modi Biopic (India Today). The Illogical Victimization Of Director Tharun Bhascker - How Far Do We Really Get It? [VoxSpace Life] Modi's Ache Din : Was The Modi Led BJP Government Worth The Try?